Valentine’s Day will soon be just around the corner. It’s a day we celebrate our love for our family and friends. We buy greeting cards and perhaps candy, flowers, jewelry or stuffed animals to go along with it. We receive great joy from loving others and having that love returned to us. One of the most beautiful love poems of all time is Elizabeth Barrett Browning’s poem, “How Do I Love Thee” let me count the ways – and then she begins to list them. And so it is with each of us. We have our own list of why we love someone else but love is really immeasurable and hard to encompass all that it is into words. God’s great commandment is that we love one another as He loves us. All of us want to experience a “love story”. We want to be loved and have someone to love. And our sincere desire is to have lots of love for our whole life through! Well I have good news! God has provided so that no one, no one be without their own love story. God has given us His own special Valentine greeting card – and guess what? It’s not just for Valentine’s Day but for every day, in fact, as long as we live. His card isn’t from Hallmark, although it begins with “H”. It’s from Heaven. It has a special name. It is called the Bible. And in it He answers Elizabeth’s question – How do I love thee? – throughout this entire book. He answers that question, page after page, He lists His ways and why He loves us. There are so, so many ways but I would need tons of journals to list them all but I think John 3:16 says it all: “For God so LOVED the world that He gave His only begotten Son that whoever believes in Him shall not perish but have eternal life.” He is our creator and loves us with an agape love and His words assure us that nothing can ever separate us from Him. So I thought perhaps this Valentine’s Day we might take the time to raise up a special greeting to our God. He would love it! Just offer up praise, thanksgiving, and a joyful “I love you!” He’ll be glad to receive it and glad that you thought of Him. Take a piece of paper, fold it in half, then fold it in half again. Now you have a card. Make your own card for your spouse. Write your own “how do I love thee”. Oh some of you may be shy but come on, you can do it if you try! makes you laugh, the one who is always there for you when you need them. At Gracie’s farewell coffee hour people got up and spoke about why they loved her. She was so surprised and said she couldn’t believe everything they were saying about her. So let’s give someone else that “I can’t believe it” moment. Don’t wait. Well friends, I hope you are all up to the challenges. Just try. I wish you all a very loving, happy Valentine’s Day with lots of hugs and kisses. P.S. 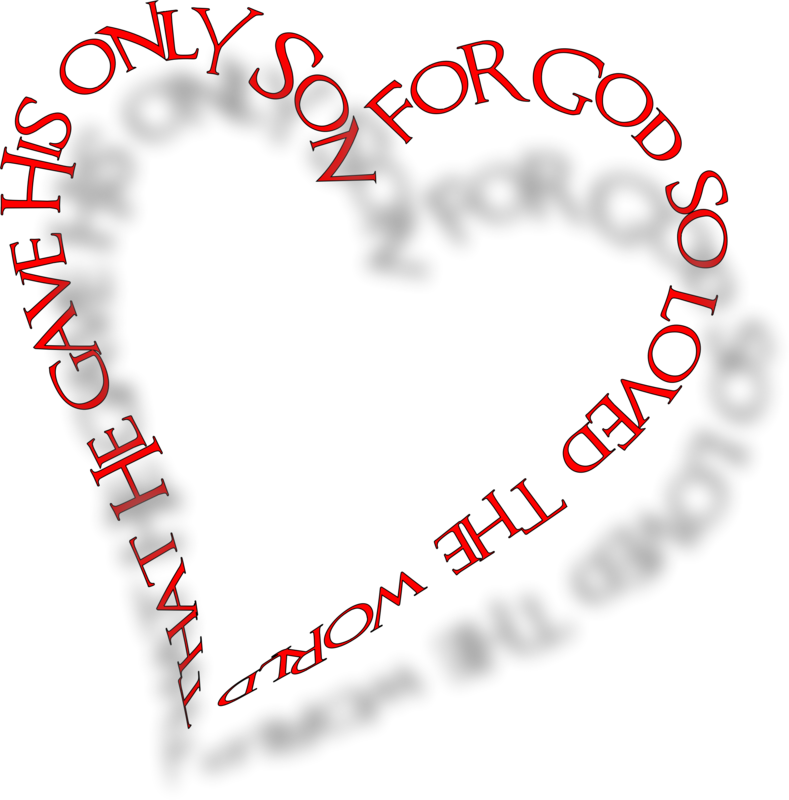 Don’t forget God’s Valentine card!